What a fun Tuesday night!! 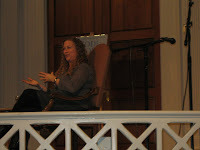 Mom and I bought tickets awhile ago to see Jodi Picoult at the Sixth & I Synagogue in DC. A fun evening that started at a restaurant close to my house - Mama's Kitchen. Then we ventured into DC. After waiting outside and chatting it up - we went in and chose seats on the second row. Picoult entered the room - the house went still. She was interviewed by one of our own Washington Post columnists. And questions were taken from the audience. A song was performed from the CD that is given with the book - amazing. 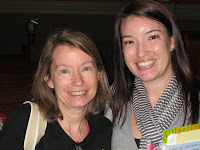 We were in the beginning of the line to get the book signed and captured a gleeful picture of us with our new treasures. It was a great night and a great start to a month full of bookish things!